AL-KHOKHA, Yemen (Reuters) - A Saudi-led coalition riding high over its successful capture of Hodeidah airport from the Iran-aligned Houthis faces a daunting challenge to seize Yemen’s main seaport, the ultimate prize in the biggest offensive of the war. Alliance leaders Saudi Arabia and the United Arab Emirates have pledged a swift operation to take over the air and sea ports, without entering the city centre, to minimize civilian casualties and maintain the flow of essential goods. The alliance of Sunni Arab states believes that by capturing the port of Hodeidah, the only sea port in Houthi hands, it can bring to its knees the Iran-aligned movement that controls the capital and most of Yemen’s populated areas. The United Nations fears heavy fighting will worsen what is already the world’s most urgent humanitarian crisis, with 22 million Yemenis dependent on aid and an estimated 8.4 million believed to be on the verge of starvation. For most Yemenis, the port of Hodeidah is the main lifeline. If there is no breakthrough in U.N. efforts to reach a political deal, the coalition has two direct paths to the port: from the airport via residential areas where urban warfare would neutralize their air supremacy, or a sea landing that would open them to Houthi missiles and mines. “So far, judging from the fight for the airport, it looks like the Houthis will put up quite a fight,” said Adam Baron of the European Council on Foreign Relations. Yemeni anti-Houthi troops led by UAE forces and supported by warplanes seized control of the airport on Wednesday, in what a senior Emirati official said was a “military and psychological blow” to the Houthis. They are now consolidating their hold by pounding Houthi fortifications nearby. The Houthis hold well-fortified position in the Red Sea city to protect the key supply line to the core northern territory they control, including the capital, Sanaa. Beyond the airport in poor neighbourhoods like al-Rabsa and Ghalil, Houthi snipers and landmines lie in wait. Armed mostly with AK-47 assault rifles, the Houthis have gained valuable experience in a series of guerrilla wars. This gives them an advantage in street-to street combat if fighting extends to the densely populated areas of Hodeidah, a city home to around 600,000 people. “The plan is to secure the airport and then advance on the non-coastal road from Bayt al-Faqih to take control of the highway leading to Sanaa and Hajja road as well,” a pro-coalition Yemeni military source told Reuters. However, before reaching the main road that leads to Sanaa, coalition forces would have to cross some 10 km (6 miles) of industrial and residential areas where they could face fire from both inside the city and surrounding Houthi-held towns. UAE Minister of State for Foreign Affairs Anwar Gargash told Reuters after the airport capture that the coalition’s plan was “to squeeze” the group but declined to discuss military operations. The Western-backed coalition intervened in the war in 2015 to restore a government ousted from the capital by the Houthis. 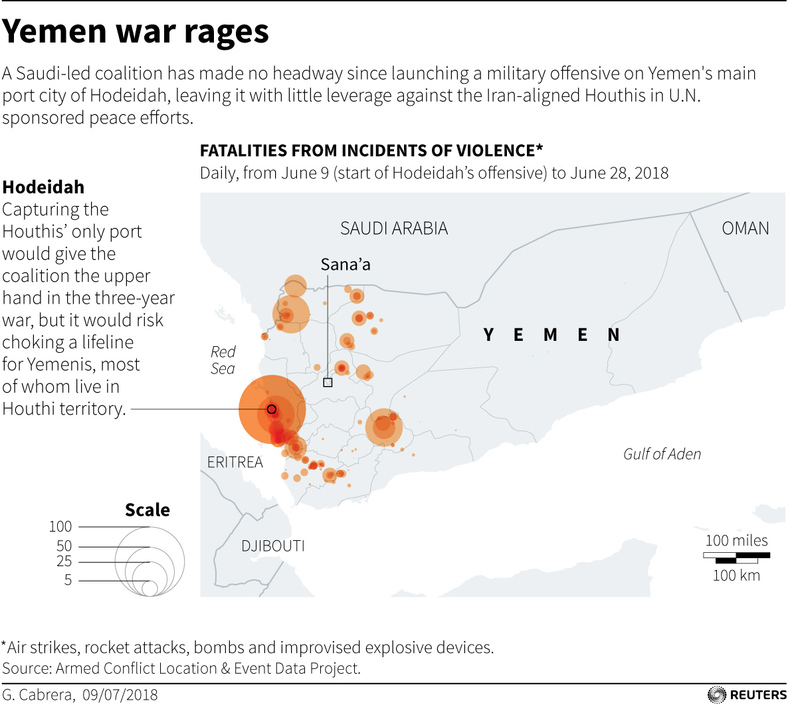 Coalition forces quickly retook the southern city of Aden and smaller towns on the coast, but since then neither side has made much progress in the war, widely seen as a proxy conflict between Saudi Arabia and Iran. Al-Khokha, located 90 km (56 miles) south of Hodeidah, was one of the few gains by the coalition in the three-year war and is now one of the resupply centres for troops on the frontlines. The UAE has set up large military facilities in al-Khokha, and in neighbouring al-Mokha, guarded by Yemeni and Sudanese troops alongside tanks and Patriot surface-to-air missile batteries. The UAE is leading the offensive on Hodeidah with a 20,000-strong force consisting mostly of Yemenis gathered from southern separatists, Red Sea coastal plain fighters and followers of a nephew of the late President Ali Abdullah Saleh. These forces have captured a series of western coastal towns to form a narrow strip of control from the bases to the port. But the road is often blocked by Houthi attacks.